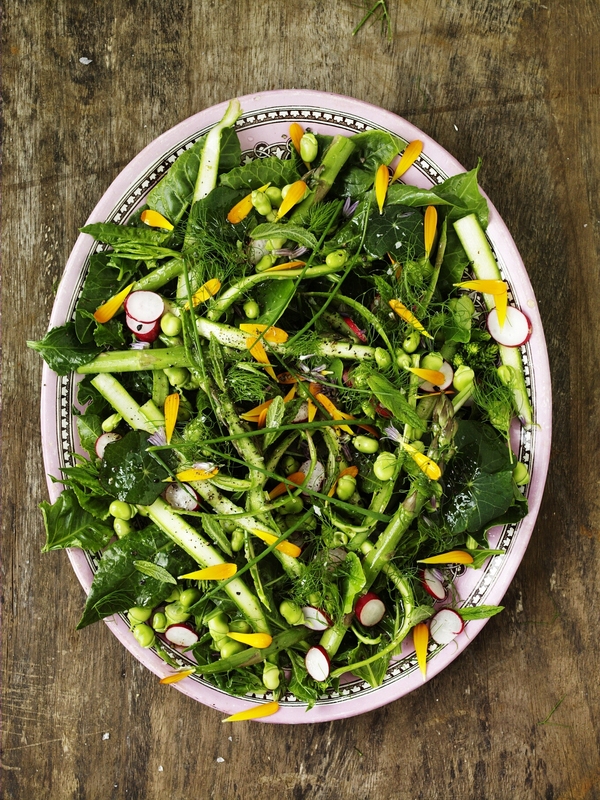 This Lovely vibrant salad can be made with young perpetual spinach. Its emerald green, irony leaves work in very much the same way. But if you do live coastally, it's quite easy to find sea beet growing around beaches and tidal estuaries. The young toothsom leaves are often cooked, but I like to use them in the same way you would a salad leaf. They add an exciting dimension here as well as a brilliant flavour. Wash the sea beet or spinach and remove any rougher stalks spin dry and set aside. Bring a large pan of salted water to the boil and add the asparagus. Cook for just 2 – 4 minutes depending on its size and age. Then drain and refresh in cold water. Pod the broad beans. If they are very fresh and young I like to use them raw. But If they are on the larger side they will need to be cooked for 3 – 4 minutes in the same salted water as well. It might be that you also need to skin them once cooked, so try them out before hand. Make the dressing by whisking together all the ingredients until the sugar had dissolved. To assemble the salad, choose a large flattish serving platter. Arrange the sea beet or spinach leaves on the base of the plate, Trickle with a little dressing and season with a little salt and pepper. Slice the radish into 5mm rounds and place in a bowl with the broad beans and asparagus, spoon over some dressing and toss well then scatter out over the leaves. Snip over a few chives and scatter over the mint leaves, Larger leaves can be ribboned before adding to the salad.I’ve finished the salad with a few optional extras, that we have growing in our garden at River Cottage. They aren’t essential but bring lots of character to the salad.If you can lay your hands on the herb fennel, then use some, It’s a delicate frondy herb with an aniseed flavour. Also nasturtium leaves, they make a great peppery addition too. Finish by trickling over the remaining dressing, add a flurry of marigold petals, if you have them, and bring to the table.